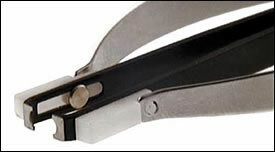 Side cutting pliers with tungsten carbide jaws for cutting watch stems. 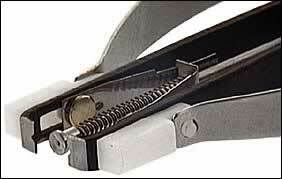 The Original High Precision Dumont Dumoxel (Anti-Magnetic Stainless) is a watchmakers favorite tweezer. 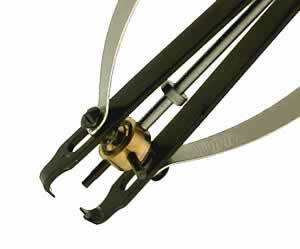 Tweezer length is 120 mm/4.728 inches, tips are 0.14 mm by 0.34 mm at the points. 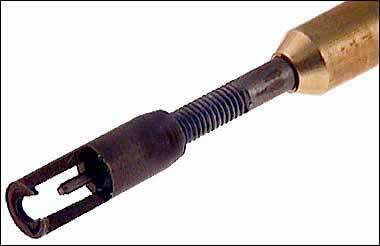 These Screwdrivers which are made in France are very well made. 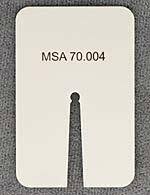 Not quite as nice as the Bergeon made ones, however these are still very high quality. 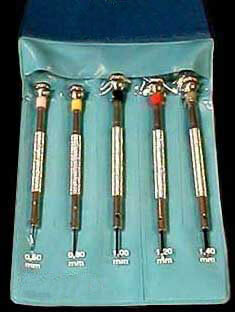 Set of five sizes: .60, .80, 1.0, 1.20, 1.40 mm. Comes with 1 of each size replacement blades. Blue tinted 25 mm lens, Swiss made watchmakers loupe. 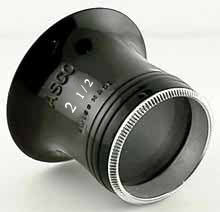 The 4 power loupe comes in focus at 2.5 inches. 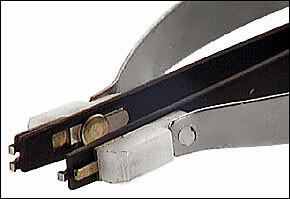 The 4x loupe is the most popular power loupe used in watch repair. The Case ScrewBalls really do work, however they will not open every case the first time. 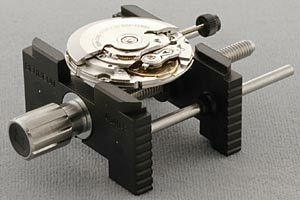 A watch that has been used for a long time can get dirt and oil in the case threads and along with the gaskets will form into a glue that will seal the backs on certain watches that have not been opened for years. Another factor is how strong your hands are, since you do have to hold the watch in your hand. What the case ball does for you is to allow you to open most cases without having to set up another tool and run the risk of scratching the case back. 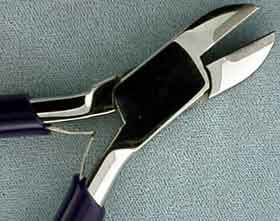 Another tool to open difficult case backs for the first time will still be needed. 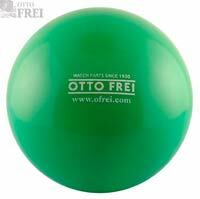 Again, what the ball does is save time and removes the risk of damage to cases. Case 10 & 11 Have Arrived! 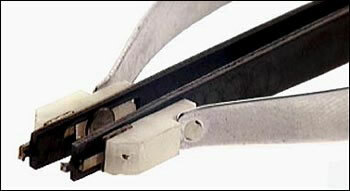 Click Here for our complete selection of Watch Bands and Straps of all kinds, Leather, Metal, Rubber, Nylon and more! While, the watch industry's name for them is just Dial. 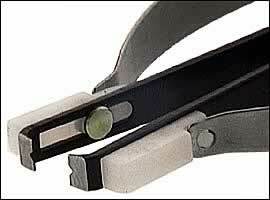 IDEAL-BERGEON folk shape tool, has many uses. The pratical tool for removing: intermediate wheels, minute and second hands, transmission wheels of chronographs and rollers. 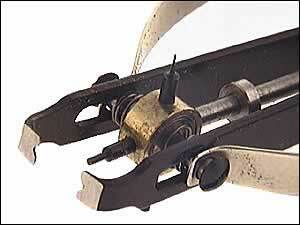 This is a must have tool for every watchmaker. 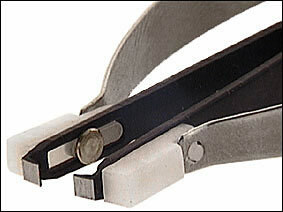 Tool to remove hands from chronographs, timers and other instruments. 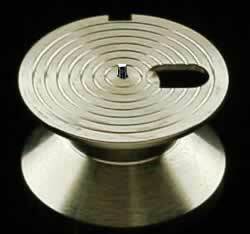 Length: 120 mm. 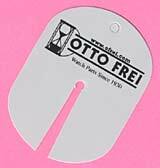 With eight tips, hole sizes of .30, .50, .70, 1.15, 1.50, 1.70 millimeters, and a holder, now you will always have the right size hand setter. 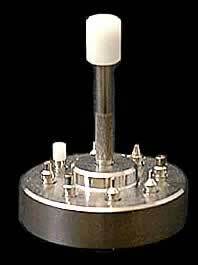 Nickel-plated base, � 50 mm.